Jesus (on the left) is being identified by John the Baptist as the "Lamb of God who takes away the sins of the world", in John 1:29. 17th century depiction by Vannini. The call of the first disciples of Jesus is a key episode in the life of Jesus in the New Testament. It appears in Matthew 4:18–22, Mark 1:16–20 and Luke 5:1–11 on the Sea of Galilee. 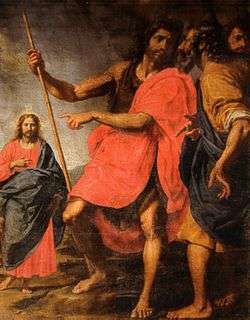 John 1:35–51 reports the first encounter with two of the disciples a little earlier in the presence of John the Baptist. Particularly in the Gospel of Mark, the beginning of the Ministry of Jesus and the call of the first disciples are inseparable. The next day John was there again with two of his disciples. When he saw Jesus passing by, he said, "Look, the Lamb of God!" When the two disciples heard him say this, they followed Jesus.... Andrew, Simon Peter's brother, was one of the two who heard what John had said and who had followed Jesus. The first thing Andrew did was to find his brother Simon and tell him, "We have found the Messiah". Andrew is often called the Protokletos or "first-called". The Gospel of Luke reports the call by the Sea of Galilee too, but along with the first Miraculous draught of fishes. In all Gospel accounts, this episode takes place after the Baptism of Jesus. The gathering of the disciples in John 1:35–51 follows the many patterns of discipleship that continue in the New Testament, in that those who have received someone else's witness become witnesses to Jesus themselves. 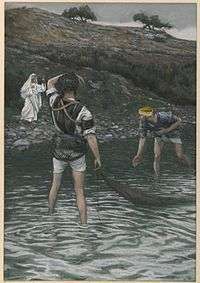 Andrew follows Jesus because of the testimony of John the Baptist, Philip brings Nathanael and the pattern continues in John 4:4–41 where the Samaritan woman at the well testifies to the town people about Jesus.